From the bestselling author of WARRIOR OF ROME comes the first book in a new series set in third century Rome, a dramatic era of murder, coup, counter-rebellions and civil war. Dawn on the Rhine. A surprise attack and the brutal murder of the Emperor Alexander and his mother ends the Severan dynasty and shatters four decades of Roman certainty. Military hero Maximinus Thrax is the first Caesar risen from the barracks. A simple man of steel and violence, he will fight for Rome. The Senators praise the new Emperor with elaborate oratory, but will any of them accept a Caesar who was once a shepherd boy? And in the streets of the eternal city, others merely pray to escape imperial notice. In the north, as the merciless war against the barbarians consumes men and treasure, rebellion and personal tragedy drive Maximinus to desperate extremes, bloody revenge and the borders of sanity. 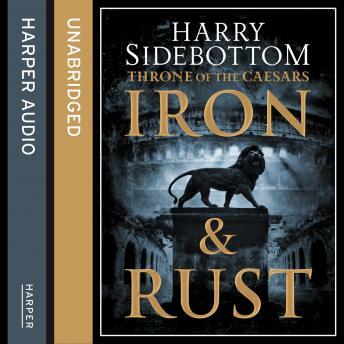 Iron & Rust, the first book in a major new series, creates a world both sophisticated and brutal, yet firmly rooted in history; a world of intrigue, murder, passion and war, a world where men will kill to sit on the Throne of the Caesars.